Hero Renewables employ some of the best Biomass Engineers in the country. Our Installation teams are equipped with the latest in Biomass technology, the most up-to-date knowledge of biomass boilers, and are able to design a system that meets your requirements, whatever the project. From huge commercial multiple unit automatic auger-fed district heating systems to small hand-fed Domestic Biomass Boilers, Hero Renewables will not let you down. To Request a quote for your Biomass Heating System, Contact Us Today. Biomass Boilers burn wood pellets, chips or logs to provide heat to your home or business’s hot water supply and to power central heating. We are often asked how burning wood can possibly be classed as renewable, and people are surprised to hear that Biomass is a ‘carbon-neutral’ energy source. As trees grow, they take in a significant amount of carbon from the atmosphere, when it is burnt in a biomass boiler, only the carbon that has already been taken out of the environment is placed back into it, no additional carbon is created. Wood is renewable as it can be regrown at the same or quicker pace than it is used. Why Should I Install In A Biomass Boiler? There are a number of reasons a Biomass Boiler is perfect for your home or business. Cost – Biomass fuel is generally much lower than the cost of fossil fuels such as Oil. However the real benefit is that the cost of Biomass fuel remains very stable, whereas the cost of fossil fuels is on the rise, and as they continue to grow more and more scarce this will only increase the cost much further. By installing a Biomass Boiler in your home or business, you can be sure that while others are depending on sources of energy with continually rising prices, you are using a renewable fuel source that will be ever affordable. 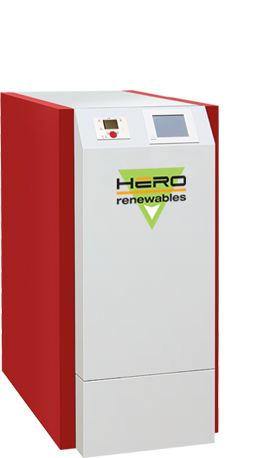 Government Incentives – Hero Renewables are an MCS accredited installer, and all our systems are designed and installed to MCS standards meaning your Biomass installation will be eligible for the Renewable Heat Incentive. The RHI pays you quarterly for using your Biomass Boiler for 7 years if you are a domestic customer and 20 years if you are a commercial customer. Future-proofing And Reliability – Biomass Boilers are incredibly reliable, they already have an established track record and have a longer lifespan than Oil and Gas boilers, with a small amount of servicing and maintenance, your new Biomass Boiler will give you years of fantastic service. Also, with a well designed fuel store from Hero Renewables, you can store enough fuel to get you through cold winters, even when fuel delivery services may not be able to get to you due to snow and ice. Our World – Biomass Boilers are a Carbon-Neutral heating source. They only release the amount of carbon that has already been absorbed by the trees in the growing process. They are also incredibly efficient, at around 90% efficiency, they waste much less fuel that a conventional Oil or Gas boiler. Using Biomass to heat your home or business means your carbon footprint will be substantially lower, and you will be contributing to a greener, cleaner world. 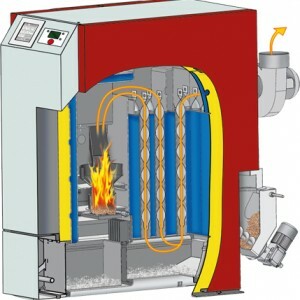 Biomass Boilers are actually very simple systems, and work very similar to that of conventional fossil fuel burning boilers. The wood fuel is either hand fed into a hopper, or automatically loaded via either a vacuum or an auger. An electric probe ignites the material, then an on-board computer monitors the combustion via thermostats in the boiler. Adjustments are made continually to the fuel supply and the fan speed. As the biomass burns, it creates hot gasses. These hot gasses are then passed through a heat exchanger, so that heat is transferred from the gasses to the water supply that is then used for your property’s hot water and central heating system.